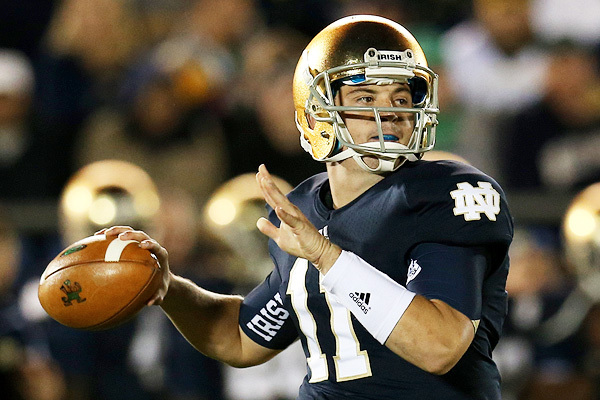 Tommy Rees will likely see his workload increase due to the suspension of starter Everett Golson. I was upset when news broke that Tommy Rees was arrested and charged with four misdemeanors. Not because the poor kid was humiliated by all major media outlets, but because that poor kid gave all major media outlets a reason to degrade the University of Notre Dame for a week. I booed as Tommy took the field for the first time this season against Purdue. I reveled in the hysteria that ensued in the rows in front of and behind me because it made me feel good about my firm stance against him. I laughed at his 2 yard rushing scamper that ended up being the deciding touchdown against Michigan. I missed the Stanford game due to a wedding. And as my buddies and I crowded around my phone at the reception, we all groaned when we saw Tommy enter the game with the time winding down. I gave him zero credit for marching the team down the field to set up a tying field goal that ultimately sent us to overtime. I gave him zero credit for his go-ahead touchdown pass to TJ Jones. And the sad thing is, I’m as guilty as everyone else. As a fan of the game, it’s easy to be a couch coach. It’s easy to pick apart each play and player and see that Tommy Rees has very little to offer in the athletic ability department. And, it’s also easy, at least as of today, to dread the 2013 season…a season that I deemed as “the year” the moment Brian Kelly took over as coach. It’s easy to hang the cleats up, hang our heads down, and once again, whip out that ever-so-lovely “well, maybe next year is our year” cliché. But I refuse to be shaken. I refuse to take part in the hysterics any longer. I stand firm by my bold, 4-year-old prediction. In 2013, we will be fine! I realize that I will receive a lot of flack for this. I also realize that I could have kept this article within the confines of my own thoughts and let someone else fall on the sword. But, I can’t stand it anymore. I’m absolutely sick of the whining and complaining. I’m tired of this fair-weather fandom. It’s time to support our team through its darkest days; time to be the best 12th man in the country; and yes, it’s time to willingly hand the reigns over to Tommy Rees. I know it’s not the ideal situation. But at Notre Dame, we ought to be used to that by now. And I’m with all of you. Tommy isn’t my first (or even second) choice at quarterback. But, all the pieces of the puzzle have fit perfectly into place for us to go on a run. Think about it. Tommy has a full season of experience, albeit not a very satisfying one from a fan’s standpoint. But, it’s valuable experience nonetheless. He has a posted record of 14-4 as a starter, and 95% of those games came as a true freshman or sophomore. The majority of his junior season was spent mentoring another freshman quarterback…one who also clearly had struggles of his own. As a teacher, I know that one of the best ways for a student to really grasp a concept is to have that student teach it to another student. Tommy spent all of last season doing just that. He also spent several minutes throughout the 2012 season on the custodial staff. He was the Mariano Rivera of the college football world. And when things got sticky, he pulled out his mop without complaining and got right to work. As much as it used to pain me to say this, he did in fact, help us march to a BCS championship berth. I’m ashamed to admit that I’ve talked with people close to the organization who say that this upcoming season is now in shambles. That we went from a 12-0 team to a 6-6 team. That there’s no way we can win valuable games without Everett Golson. Why did we even hire Brian Kelly to begin with? I mean, honestly? You think one of the winningest coaches in all of college football is concerned with the departure of one player? I understand that that one player carries a vital role within the organization, but let’s be honest here: if our team automatically goes from winning 12 games to 6 simply because we lost our quarterback, then wouldn’t it be safe to say that Kelly has wasted the last four years of recruiting and coaching? If there’s anything that Tommy proved last year, it’s that he’s more than capable of coming in when tension is high. Last year’s transition from Tommy Turnover to Tommy Ice may have, in fact, proven to be one of the most critical growth progressions on the team. And now, with our star starting quarterback off campus for a semester, I’m completely confident in Tommy’s ability to lead. Two years ago, Tommy Rees threw 14 interceptions in, what seemed like, the most crucial moments. One year ago, however, coaches praised him for his newly acquired ability to read defenses, something that Everett had a hard time grasping. What’s more interesting is that two years ago, Tommy posted 2800 passing yards to go along with 20 touchdowns and a 133.4 Passer Rating, all three marks better than Everett did in his first year as a starter. I realize that he doesn’t have the game-changing ability or ceiling that Everett has. He doesn’t have the escapability either. But, he’s a game manager. And that’s all this team will need this season. After all, isn’t that all Alabama needed the last two years? Don’t get me wrong…AJ McCarron’s 30-3 TD/INT ratio is more than impressive. But he wasn’t known last year for being an elite passer. He was known for being an elite manager. I’m not comparing AJ’s ability to Tommy’s by any means. I realize that the former will likely be suiting up on Sundays and the latter will more than likely be in a suit on Sundays. But, I am comparing the 2012 Crimson Tide to the 2013 Fighting Irish. Listen. We’re going to play a quick game. I’m going to list some attributes of one of those two teams, and you’re going to say out loud which team first comes to mind. Top-tier defense with a plethora of NFL-ready talent. Able to stop the run better than anyone else. Tight in the redzone, and stingy in the endzone. Big bodies on the line, experienced bruisers in the middle, and quick pickers in the secondary. A slew of highly-talented running backs. A position so deep that the 3rd stringer could start at most D-I schools. Blazing speed mixed with bone-crushing ability. An experienced offensive line that hardly allows opposing defenses to penetrate. Creates holes and gaps so wide, Moses would be jealous. Protects the quarterback better than anyone in the country. And finally, a signal caller who has all day to pass. Who is willing and confident to hand the ball off 50 times a game. One who can read defenses, call the appropriate audibles, and thrive in the tensest moments. If you said 2012 Alabama, great job! If you said 2013 Notre Dame, you also win! If last year proved anything about winning in college football, it showed that it is essential to have a well-rounded team…a tough defense, protection for the quarterback, deep trenches, and clock management by an army of talented running backs. The pieces are there. The personnel are there. The talent and experience is there. And though our “quarterback of the future” is not, a capable game manager is. He has nothing to lose at this point. He has doubters in every corner of the nation. He’s been booed. He’s been ridiculed. Heck, he’s even been arrested. But, what I do know is that the players love him. That he’s matured in the last two years. And that he is going to put every ounce of his ability to leading this team to another championship game. We may have to live through yet another heart-attack season. We may not win every game by 28 points like we had hoped. But, Tommy will rise to the occasion, we will win, and as dedicated domers, we will survive yet another glorious season. There. I did it. I convinced myself that we’ll be fine. Go Irish! I totally agree. We have been in crazy situations before and have always come through. GO IRISH!